Don't believe them when they say you can't please all the people all the time. 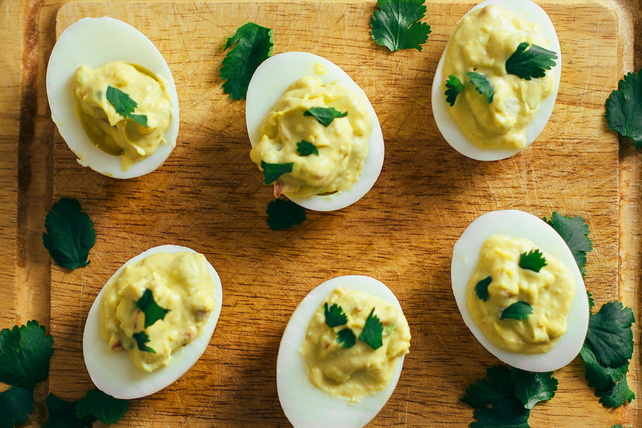 Serve our devilled eggs stuffed with creamy guacamole and see for yourself! This Guacamole-Stuffed Devilled Egg recipe is a must-try. Cut eggs lengthwise in half. Remove yolks; mash with fork in medium bowl. Add Miracle Whip, onions, peppers and lime juice; mix well. Gently stir in avocados and tomatoes. Eggs can be stuffed ahead of time. Refrigerate up to 2 days before serving. Place eggs in single layer in saucepan; add enough water to completely cover eggs by at least 1 inch. Bring water boil; cover. Remove saucepan from heat; let stand 15 min. Drain eggs; immediately place in bowl of ice water. Let stand until completely cooled, changing water if necessary. Perfectly hard-cooked eggs will have a firm yellow centre with no greenish tinge. Hard-cooked eggs in their shells can be refrigerated for up to 1 week.